“Yellow Tree’’ is adding some color to Western Ave.
Western Avenue in the Allston-Brighton neighborhood may look a whole lot different in the coming decade, but small efforts from the area’s artistic community are helping to add a dose of beauty to the changing scenery. 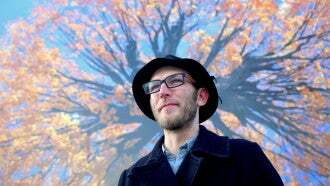 Saturday marked the opening of an installation at 357 Western Ave– a 3,000 square-foot photo mural called “Yellow Tree.’’ The vibrant piece, created by local artist Zacharie Lanoue, is the realization of a vision that he had when he was much younger. The technique he refers to involved taking hundreds of photos of a maple tree at the same angle, but at different positions around the tree. The style, he said, is similar to orthophotography, but it’s a method that he arrived at by himself. The mural now proudly drapes along the side of 357 Western Ave., a space donated by the landlord, The Davis Companies. While Lanoue was the mastermind behind the work itself, much of the legwork required to get the piece commissioned and approved was a collaborative effort between curator Olivia Ives-Flores of Oh Olive Creative, creative director Emily Isenberg of Isenberg Projects, and Graffito SP, a consulting group that works with real estate developers and landlords to develop creative, community-centered solutions for activating urban places. The installation is an early piece in a long-term Harvard-funded initiative to explore how public art can activate Western Avenue. The project could last up to a decade, as more development begins to change the landscape of the neighborhood. Lanoue’s installation is the first of its kind in Boston, and he will be sharing his techniques in a free interactive workshop on March 12 at the Harvard Ed Portal. If you’d rather just admire, “Yellow Tree’’ will be on display for the rest of the winter and early spring.